I am not really keen about true vibrato for telecaster because I don't pay attention to the added accessories of any musical instruments. Yet, I know that having a true vibrato will certainly enhance the sound of musical instrument. Add-ons such as the true vibrato might be expensive but for the band or for those who do gigs all the time, this gadget is worth buying for. Last Friday, we went to a neighborhood restaurant in Cape Canaveral and they have a live band that started playing at 6 PM. I do remember now that the guitarist has some gadgets on his guitar. 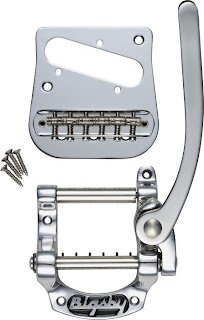 For all I know, it could be a bigsby b5 and he did play great. He even had a solo just plucking and strumming his guitar and everyone in the bar just appreciate the sound he made. Well, the gadget must be it!